Well, you know the saying, and it’s true. Times have changed. Some of the rules surrounding tree planting that were considered correct in the 70’s and 80’s are no longer considered good arboriculture practices. There are still simple mistakes being made that come back to haunt us. Many landscapers still do not understand the basic rules of plant growth and pruning. By understanding the variables of grade, texture, the structure of the soil, space allocation, and sun exposure, we can make better decisions that ensure the long-term health of your plants. Additionally, we can consult with you on what tree will best fit your space. Our goal is to you and your trees a happy outcome that will work for many years to come. Trees bring a wide variety of benefits to your property that you might not even realize. For one, trees bring immense aesthetic value to your property. They can accent structures and landscape beautifully, helping the curb appeal of your house or land. 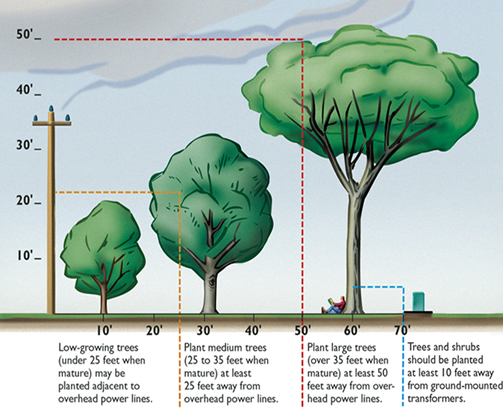 Trees also provide valuable shade, which can help to cut down on cooling bills in the summer. Trees also provide a wide variety of benefits to the environment by providing a natural habitat for wildlife like birds, and by slowing the impact of rain on the land. Trees are natural respirators, meaning they give off fresh oxygen. They can even help to protect structures and landscaping from harsh elements like wind and rain. At New Day Arborist & Tree Service, we can help you to choose which tree is right for your property and help you to plant it, so it has the best chance of success. When choosing trees or shrubs for your yard, one of the most common questions that we are asked is, “should we plant deciduous trees or evergreen trees?” Ultimately, it all boils down to personal preferences that and reasonable expectations. No matter what you are choosing, you will likely see better long-term results if the tree you pick is a native of the area. New Day Arborist & Tree Service are experts in native PNW trees, so we have you covered! Whether you end up choosing a deciduous or evergreen tree will hinge on your goals for the tree. Obvious aesthetics are important. When you choose a deciduous tree, you get to enjoy the new foliage in the spring, fleshy leaves in the summer, and fall color in the autumn. In the winter deciduous trees look pretty bare. If you want a tree that provides privacy all-year-long, an evergreen may be a better choice. Because we live in the Pacific Northwest, we benefit from having a wide variety of both deciduous and evergreen trees to choose from, so we know you will be pleased! Contact us today with questions or to schedule an appointment!